If you ever get into trouble while swimming in a lake or ocean, help may just come in the form of a flotation device-toting flying drone. Students from the King Low Heywood Thomas School of Stamford, CT, in cooperation with Flying Robots LLC, designed a clip-on accessory called Project Ryptide that fits onto just about any consumer drone or RC helicopter. It clips on in under 30 seconds and weighs just 410 grams. 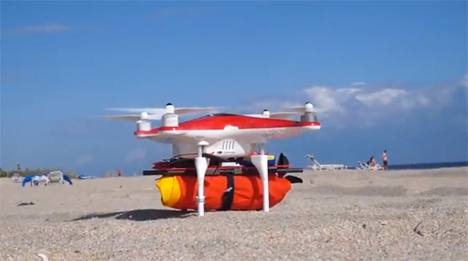 Any RC copter that can carry a GoPro camera can carry a Ryptide self-inflating flotation device, though the team developed it to work with the DJI Phantom. 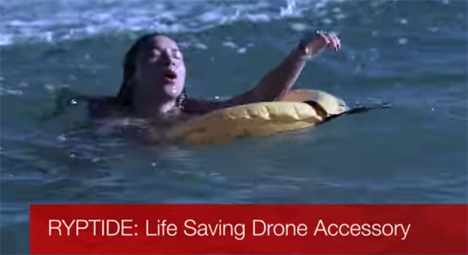 After the short 30 second preparation, the drone can carry the life-saving flotation device to the distressed swimmer and drop it. A radio-controlled trigger activates the floatie’s inflation. There appears to be a lot of room for user error here since a human being directs the drone and decides where to drop and deploy the flotation device. Distances can be incredibly difficult to judge from shore to water, so some kind of proximity sensor would be useful. Still, even dropping the flotation device in the general area of the distressed swimmer would be more helpful than standing on the beach doing nothing. See more in Robotics or under Technology. January, 2015.